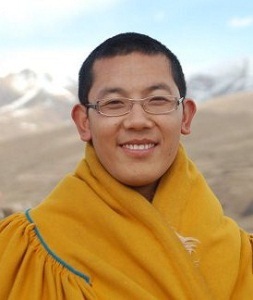 Nangzhig Kyabgon was born in 1983 and was recognized as the reincarnation of Nangzhig Kyapgön Tenpa Rabgye by high lamas of both Bön and Buddhist traditions. This includes lamas such as Menri Yongzin Tenzin Namdak Rinpoche and the late 10th Panchen Lama. At the age of six, Nangzhig Kyapgön took monastic vows in front of the golden tombs of Nangzhig high lamas. He was initiated in the presence of four lamas, including Jawob Rinpoche. all of his followers. He blessed the faithful with his empowerments of A Tri (A khrid), Nyengyü, and Dzogchen as well as with the internal, external and secret Bön initiations.